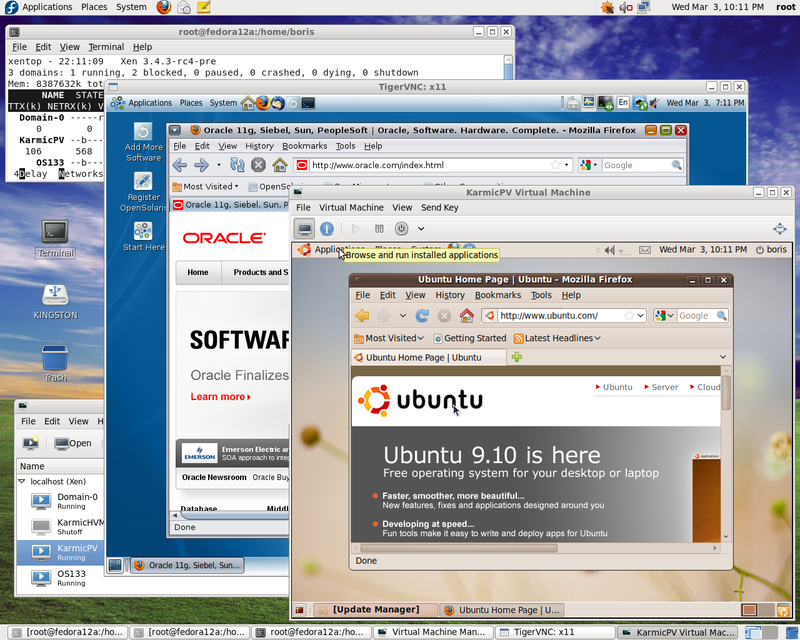 The final target of this post is to demonstrate how flexible is Ubuntu Karmic Koala Server environment. Build Xen 4.0 and the most recent stable pvops kernel 2.6.32.12 ( with DRM support). Loading Xen Instance followed by install Ubuntu’s Libvirt environment, providing utility virt-install for creating PV and HVM DomUs, virt-manager completely functional to manage any DomU been built via virt-install. Change-set 21112 from xen-4.0-testing.hg back ported to Xen 4.0 to support grub2 notation ‘(hd0,1)’ specific for Ubuntu 10.04 aka Lucid Lynx. due to Changeset 19594 in xen-3.4-testing.hg. Otherwise, Xen packages would go to /usr/lib/python2.6/site-packages, which is not default location for python 2.6 on Ubuntu 9.10 ( vs F12 ). Thus you won’t be able to start xend in Dom0. 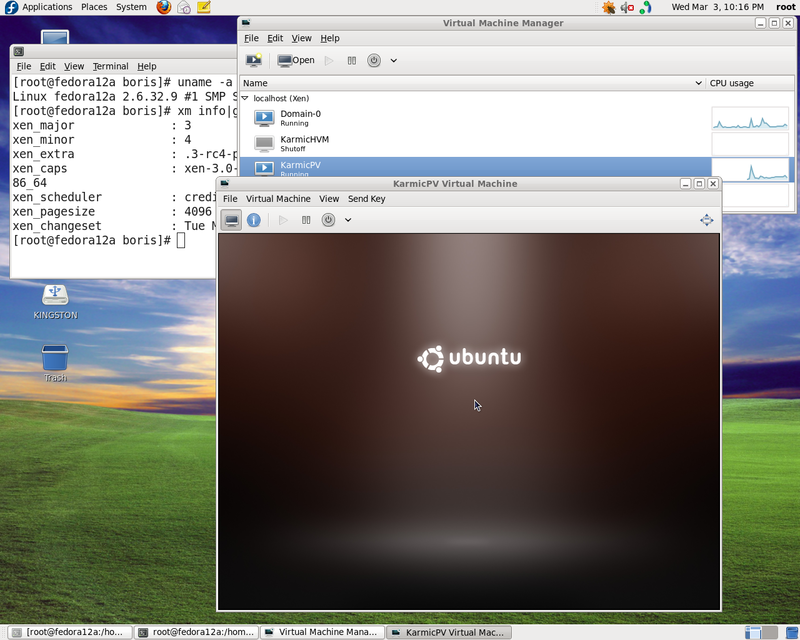 Two steps in procedure bellow make Xen default Hypervisor on Ubuntu 9.10. 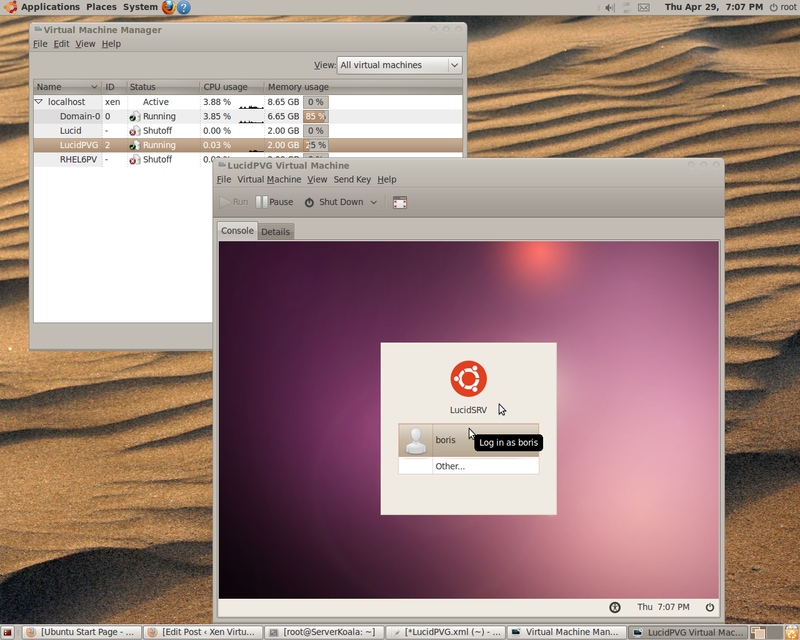 4.Untar linux-2.6.31.12.tar.bz2 and apply patches. will result building the most recent 2.31.6 version of pvops kernel. Branch above , actually is not required to be checked out . It’s default branch of “git clone”. 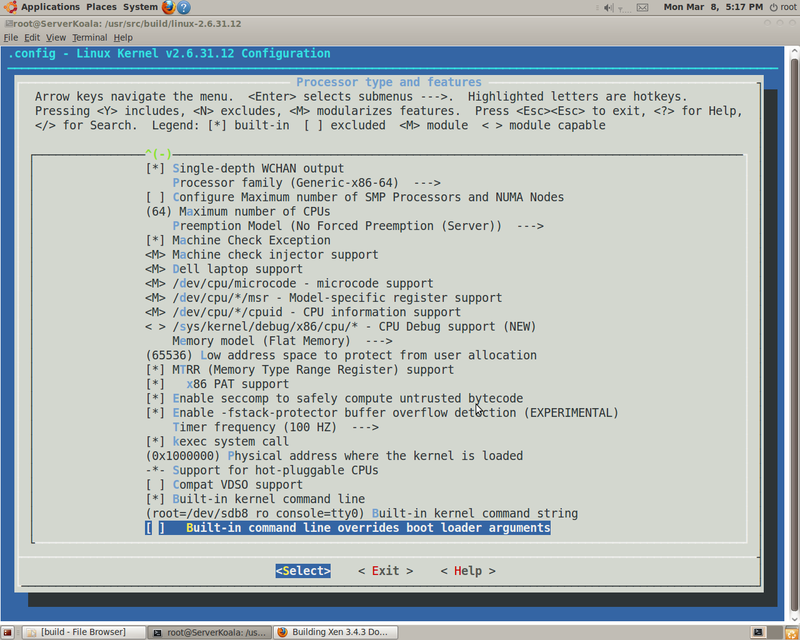 Difference in meantime is “acpi” branch not merged yet to xen/stable. However, APIC rework has been committed for 2.6.32.9. With the most recent 2.6.32.9 i was able to enable DRM for Radeon and get positive dmesg report on F12 and Ubuntu Karmic Koala Server. Tuning Config.mk results Xen packages to be placed into /usr/local/lib/python2.6/dist-packages due to Changeset 19594 in xen-3.4-testing.hg. Otherwise, Xen packages would go to /usr/lib/python2.6/site-packages, which is not default location for python 2.6 on Ubuntu 9.10 ( vs F12 ). Thus you won’t be able to start xend in Dom0. 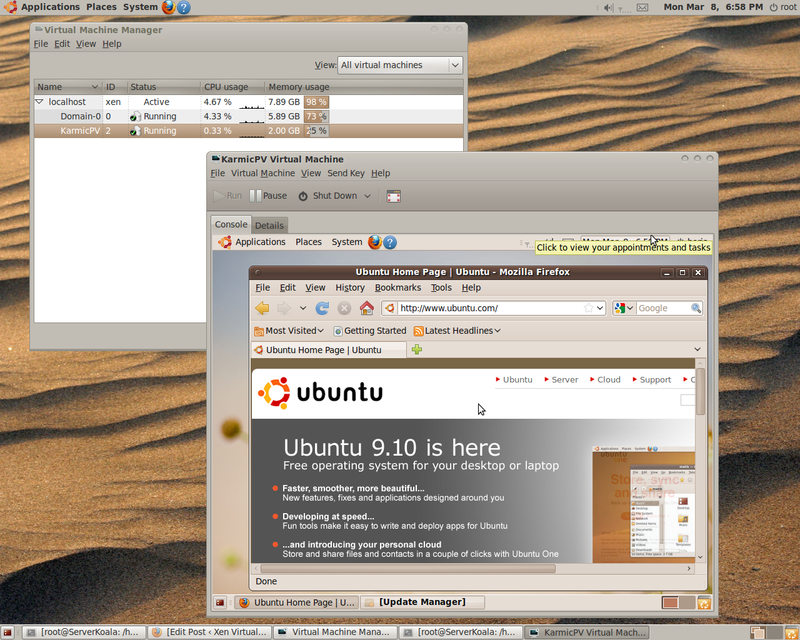 Same thing happens when building Xen Unstable on Ubuntu 9.10 Server. 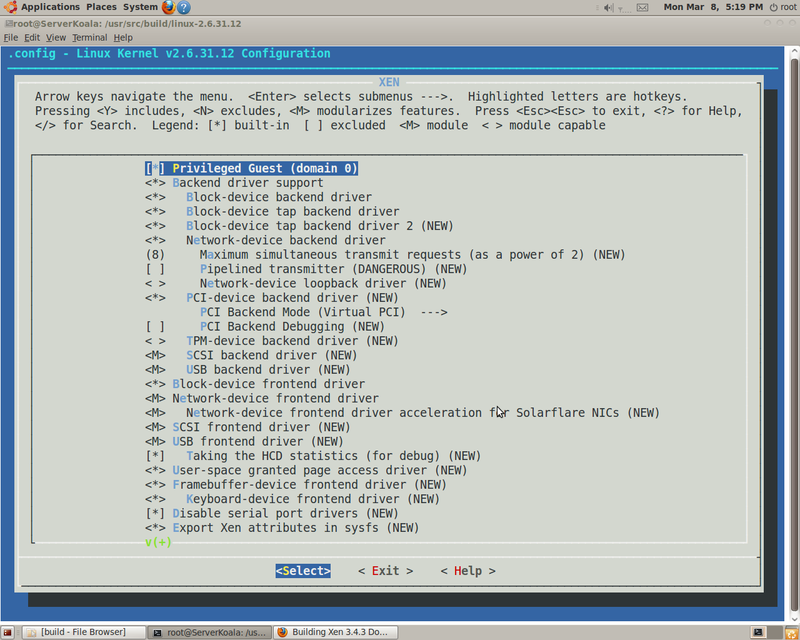 Now install current Xen 3.4.3 Hypervisor on Fedora12 and proceed as usual. Git Repository to support Xen 3.4.3 Dom0. 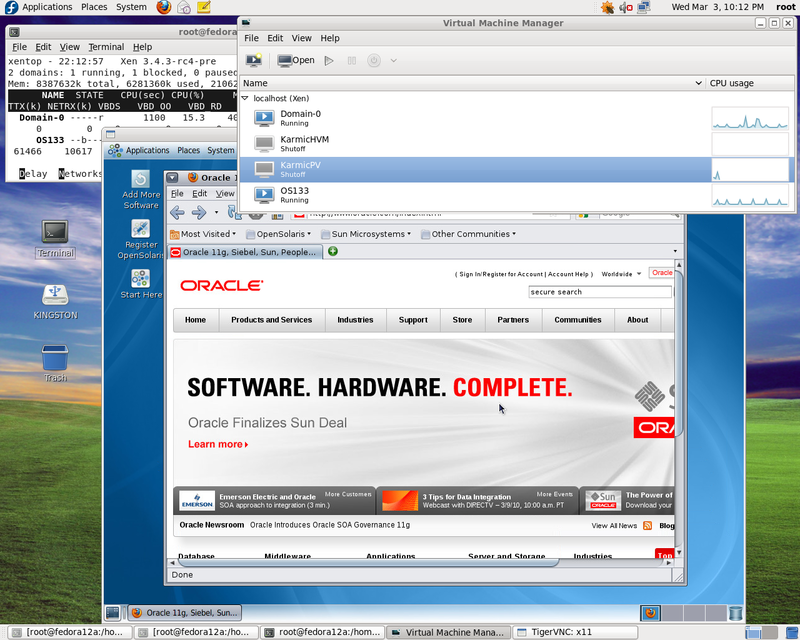 You are currently browsing the Xen Virtualization on Linux and Solaris blog archives for March, 2010.